But there is another great racket: The Yonex Voltric 70. It is, according many experts, a racket that brings you the perfect balance of attack and defense. 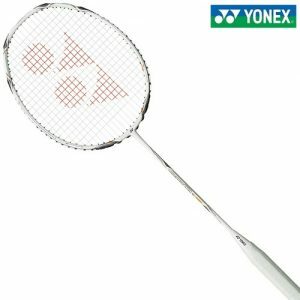 If you are looking for powerful smashes and excellent drops, then this racket is perfect for you. Its heavy head balance and super-light weight make it a lethal, fast and powerful racquet. If you want to discover all of its advantages, then just keep reading. Again, delivered by Yonex one of the best badminton racket brands in the world. The Voltric 70, just like the amazing Voltric 80 or the Voltric Z Force II, is an excellent choice. It has got plenty of power, a solid handling and excellent defense skills. That’s why I highly recommend it to you if you are looking for a racket that’s good in terms of defense yet is packed with plenty of power. If you want to know more about this racket, then be my guest and allow me to show you all the great advantages of this amazing product. Let’s understand how it works by analyzing its design and construction. I like it very much in terms of aesthetics. It’s almost fully black accompanied by some chrome color in some parts of the frame. It looks serious, powerful and modern. And now it’s time to analyze the most interesting part: The technology found in this racket. Of course, it comes with the classic Tri-voltage system found in all Voltric rackets. It combines a stiff structure at the top of the frame and thin frame sides, which allows you to deliver shots with more power. This superb combination is pure power. Superior shock absorption. The shaft is made of Ultra PEF, which grants you superior shock absorption for a better performance in your matches. Excellent aerodynamics. The design of this racket make it cut easily through the air and move very fast. It’s mainly due to the thin sides of the frame, which greatly reduce air resistance. Powerful sounding. It’s been designed to reduce dull soundwaves and high-pitched sounds, so you can get a sharper and more powerful sounding. This will bring you more encouragement and put more pressure on your opponents. Super agile. The swings are fast and smooth. They may not be as fast as with the Z Force II, but they are pretty decent, and this is a good proof of the excellent maneuverability it offers. Top-notch repulsion power. Thanks to the Super High Modulus Graphite technology you will enjoy a superior repulsion power for a better badminton experience. Excellent maneuverability and minimal air resistance. It’s all thanks New Control Support Cap, which brings you a wider flat surface and less air resistance, which gives you as a result a faster and highly-maneuverable racquet. New built-in T-joint. Want less torque and more stability? Then this feature will give you so. It greatly improves the stability of the shuttle on the string bed, which brings you far more precision with your shots. As you can see it’s equipped with many interesting pieces of technology that will bring you a superior performance at the hour of playing. But now it’s time to analyze its performance during the game by analyzing different types of shots. I have to tell you in advance that it has a superb performance, but let’s get into detail. As expected, you can throw clears without major effort. They will go with plenty of power and very far by the way. You really can feel how the shuttle abandons the string bed, which gives you a better idea on what you are doing, and therefore, more control. It’s easy to serve with this racket, and you can really feel the power and capability of this racket with backhand serves. It performs very well with both defensive and offensive drives. Although, it shines with defensive drives. It’s pretty good in terms of defense. It may not be as good as the Nanorazy Z Speed, yet it’s still pretty good. Moreover, thanks to this racket and its incredible shock absorption and excellent maneuverability you will be able to receive smashes very well, doesn’t matter how strong they are. In my opinion it’s an excellent racket. If you are looking for a good blend between defensive and offensive features, then the Voltric 70 is everything you are looking for.